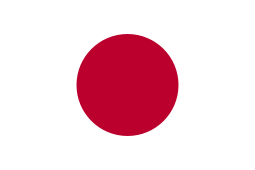 A general election in Japan was held on 11 September 2005 for all 480 seats of the House of Representatives of Japan, the lower house of the Diet of Japan, almost two years before the end of the term taken from the last election in 2003. Prime Minister Junichiro Koizumi called the election after bills to privatize Japan Post were voted down in the upper house (which cannot be dissolved), despite strong opposition within his own Liberal Democratic Party (Japan) (LDP). The election handed a landslide victory to Koizumi's LDP, with the party winning 296 seats, the largest share in postwar politics. With its partner, New Komeito, the governing coalition then commanded a two-thirds majority in the lower house, allowing them to pass legislative bills over the objections of the upper house and (though the government did not attempt this) to approve amendments to the Constitution, then submit them to the upper house and a national referendum. The opposition Democratic Party of Japan (DPJ), which advocated a change of government during campaign, suffered a devastating loss, winning only 113 seats against 175 seats it held going into the election. The setback led the DPJ leader Katsuya Okada to resign, and raised a question whether the DPJ can remain an alternative to the LDP in the future elections. The small parties made only small gains or losses, with Koizumi's ally, New Komeito, falling slightly from 34 seats to 31. Of the new parties contesting the election, the New Party Japan fell from three seats to one, while the People's New Party was unchanged at four seats. The Japanese Communist Party held its ground with nine seats, while the Social Democratic Party won seven, a gain of one. Prime Minister Junichiro Koizumi dissolved the House of Representatives and called for new elections on 8 August 2005. The move was made in response to the defeat of bills that would have split Japan Post into four private companies over a period of ten years, on which Koizumi had staked the credibility of his reforms. The package was notably unpopular within Koizumi's own Liberal Democratic Party, as retired employees of Japan Post have been strong supporters of the LDP in past elections, and its banking system, the world's largest, has bankrolled expensive public work projects, providing business for the LDP's supporters in the construction industry. Koizumi used the threat of an early election to push the bills through the House of Representatives (the lower house), where it was approved by just 5 votes. The same threat was less effective in the upper chamber, the House of Councillors, which the prime minister does not have the power to dissolve. On 8 August 2005, 30 LDP members of the House of Councillors joined the opposition in voting 'no' or abstaining to block the legislation. Koizumi had announced that a 'no' vote would be considered equivalent to a no confidence vote against his administration, and thus called a snap election for the House of Representatives. The dissolution act itself is relatively without controversy, and is based on Article 7 of the Constitution of Japan, which can be interpreted as saying that the Prime Minister has the power to dissolve the lower house after so advising the Emperor. Many politicians from both the government and the opposition camps, however, had criticized the unusual move of dissolving the lower house following an upper house defeat as both illogical and adversarial. Polls from Asahi Shimbun and others showed that the public supported Koizumi's decision to call an election. The approval rate for Koizumi's Cabinet, in fact, leapt to 46 points when the election was called, and subsequently recovered 50%, a very high rate by Japan's standard. Before the dissolution, there was notable dissatisfaction with the decision to dissolve within the LDP, because the LDP and its government partner, New Kōmeitō, feared losing their majority in the lower house, which chooses the Prime Minister. In the previous lower-house election (2003) and upper-house election (2004), the Democratic Party of Japan (DPJ) had performed handsomely, while the LDP was barely able to keep its majorities with a reduced number of seats despite the popularity of Koizumi. Election analysts ascribed the poor performance of the LDP to Koizumi's reforms that have eroded its traditional supporters such as farmers, "Mom-Pop" shop owners and construction workers, because the reforms, including deregulation and tax cuts, were tuned to help big global corporations like Toyota. Many in the LDP, among whom was Yoshiro Mori, former prime minister and Koizumi's long-time backer, showed a concern that the widening splits between Koizumi and the rebels within his party would help the competing DPJ candidates win seats in highly contested districts. At the height of the protest, Koizumi even had to dismiss a member of his Cabinet when he refused to sign the Imperial Ordinance for dissolution. There had also been concern that the so-called "political vacuum", created if both the LDP and the DPJ fail to gain a clear majority, would impede the already sluggish recovery of the Japanese economy. Prime Minister Koizumi had tried to make the election a referendum on the privatization of Japan Post and reforms that follow, saying that he would step down if the ruling bloc fails to secure a majority. Indeed, the DPJ, which did not have a clear position on the privatization issue previously, was forced to come up with an alternative plan to shrink public savings in Japan Post over years to come. In addition, his personality was featured as prominently as policy in the election, as the electorate were asked to determine whether Koizumi's behavior, variously described as either determined or pugnacious, was acceptable for a Japanese prime minister. The main opposition Democratic Party of Japan (DPJ), consisting of former LDP members and liberals, saw the election as a chance to end the LDP's nearly continuous 50-year control of the government and to start reforms of government spending and employees. Many analysts believed that the DPJ would be less beholden to special interests than the entrenched LDP, and a change of government was vital to lead to a true democracy in Japan. On 10 August, Katsuya Okada, the leader of the DPJ, said that he would resign if the DPJ failed to take over the government, paralleling Koizumi's stated intention. In domestic policy both the ruling bloc and the DPJ differed little; both concurred in the need to seek small government in general by cutting public works spending and reducing government employees, in contrast to the views of other small parties. Also, to a degree they did not deny the need for the future increase of the consumption tax and revoke temporary tax cut in order to improve the financial health of the government, which is the worst among the developed countries and nears that in wartime, and to cover the rising social security costs due to Japan's aging and declining population. The DPJ leadership even admitted that, if they won the control of the government, they would not revert Koizumi's four-year-long reforms but redo them with more vigor and thoroughness. Outside Japan, there was much speculation about how the election could change foreign relations, since foreign policy is one of the major differences between the LDP and the DPJ. The LDP's Koizumi has been notable for his foreign policies supportive of U.S. President George W. Bush. In particular, the administration has faithfully supported the Iraq War, sending JSDF troops to Iraq in spite of public opposition and the country's pacifist constitution. Moreover, the relationship between Japan and China deteriorated in early 2005, when Koizumi and other conservative Japanese politicians angered China through their visits to the Yasukuni Shrine, amongst other actions. In contrast, Okada, the leader of the main opposition DPJ, said he would pull the troops out of Iraq by December 2005 if he won the government. He also pledged that he would not visit Yasukuni Shrine; this could noticeably improve foreign relations with South Korea and China. However, in Japan, foreign policy issues had drawn almost no attention during the campaign. 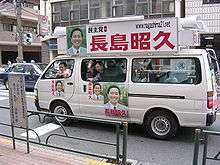 DPJ candidate Akihisa Nagashima (who failed to win his district in Tachikawa, Tokyo) in his campaign bus. Koizumi maintained, as he pledged before calling the election, a position that he would not give official party endorsement to 37 members of his party who voted against the postal bills; that is, the 37 were not allowed to run as members of the party. To compensate for the disadvantages that non-party members suffer under the current election law, four LDP rebels including Shizuka Kamei announced on 17 August their formation of a new party, the People's New Party, to contest the elections. Four other LDP rebels followed suit days after, forming New Party Japan (not to be confused with the Japan New Party of Morihiro Hosokawa) with a popular Nagano governor Yasuo Tanaka as head. However, most rebels have not joined the new parties, preferring to run as independents so as not to sever their ties with local LDP organizations. 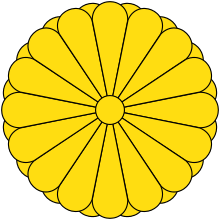 The formation of the new parties, which were largely seen as being solely needed for the election campaign, took place as Koizumi and his party's leadership were actively recruiting candidates to run in single-member districts against the rebels, and were pressuring local organizations to back the new candidates. New LDP candidates include celebrities, bureaucrats, and local politicians, and several rebels exited the race rather than run against their own party. Among the most publicized candidates was maverick businessman Takafumi Horie, who ran as an independent (with tacit LDP backing) against Kamei in Hiroshima District #6, a hot battleground in the last election between the then LDP's Kamei and a DPJ candidate. Japanese House of Representatives composition following the election. Pre-election polls had been consistently showing the LDP's solid lead, especially among independent voters in urban areas like Tokyo and other big cities nationwide where its main opposition the DPJ had had a main support base. Newspaper surveys predicted a big victory for the LDP, which could lead the DPJ, young and short on unity, to disintegrate. Election analysts, however, warned that few LDP candidates were enjoying comfortable leads, and there was still a large number of undecided voters who went for the DPJ in the last election, thus the election results were far from being set. The actual election results closely matched what the pre-election polls, which experts believed were unlikely to materialize, had predicted. Election results gave the governing coalition 327 seats, more than a two-thirds majority in the lower house. In general, the LDP roughly held its own in rural areas, retaking about half the seats held by rebels, but holding steady or even falling slightly against other parties. On the other hand, in urban areas the LDP had a devastating victory, reducing the DPJ from twelve single member constituencies to one in Tokyo, from nine to two in Osaka and from eight to zero in Kanagawa. The so-called 'assassin' candidates recruited by the LDP to stand against the disendorsed party rebels met with mixed success. Although 20 were elected, only 9 of these managed to defeat rebels in single-seat constituencies, with the remaining 11 elected by proportional representation. 5 'assassins' failed to be elected. Another casualty was the prominent independent candidate Takafumi Horie who was defeated by the LDP rebel Shizuka Kamei, now representing the People's New Party. One of the biggest landslides in Japanese politics came as a great surprise to virtually everyone, from politicians in both government and opposition camps to political analysts and the general public to finally Junichiro Koizumi himself, who reiterated after the election that he just asked for a majority. In particular the DPJ's catastrophic defeats in the capital area (namely Tokyo and Kanagawa) shocked the party's members with no clear strategy to reverse the trends in future elections, as well as the LDP leadership who were now concerned that the LDP might have won such a great victory that it could lead to a swing against the party in the future. Analysis of the votes shows that the degree to which the electorate shifted their votes from the LDP to the DPJ was not as considerable as the number of seats exchanged; the LDP won 47.8% of the total votes, up from 43.8%, while the DPJ collected the same percentage (36.4%) as it did in the last lower-house election two years ago. Indeed, New Kōmeitō even lost three seats despite winning more votes than ever. Political analysts attribute this discrepancy to, in addition to the historically high turnout (67.5%), the switch of the election system a decade ago from the traditional medium-sized constituency system to today's system that combines single-seat constituencies and multi-member constituencies elected by proportional representation. The irony is that it was Koizumi who was a vocal critic of the switch and the likes of Okada and Ichirō Ozawa, the DPJ's deputy leader, who departed from the LDP to have made the switch in a bid to create the two-party system. Seats prior to the election. ↑ 9 Aug 2005 (9 August 2005). "Asia Times Online :: Japan News and Japanese Business and Economy". Atimes.com. Retrieved 4 June 2010. ↑ Archived 28 February 2006 at the Wayback Machine. ↑ "Bing". Mdn.mainichi-msn.co.jp. Retrieved 4 June 2010. ↑ Archived 9 March 2006 at the Wayback Machine. ↑ "asahi.com： 2005総選挙". .asahi.com. 18 September 2005. Retrieved 4 June 2010. BBC News (8 August 2005). "Japanese PM Calls Snap Election." Mainichi Shimbun (8 August 2005). "Koizumi Dissolves Lower House for Snap Election." Kajimoto, Tetsushi (9 August 2005). "Koizumi Calls Election for 11 September." Japan Times. Dore, Ronald (8 August 2005). "A Contemporary Dilemma Haunted by History." Times (London), pp. 11. Asahi Shimbun (9 August 2005). "Political Parties Scramble to Draw Up Manifestoes ahead of Snap Election Next Month." Economist article (25 August 2005). "Out with the old guard?" Manichi Daily (11 September 2005). "Koizumi leads LDP to landslide." CNN story (27 August 2005). "Poll: Opposition gains in Japan"
Manichi Daily (11 September 2005). "2005 Election Site"
FairVote: "Japanese Parliamentary Elections 2005"